A second chance . . . all of us have needed one at some point in our lives. As children, we beg our parents to give us "just one more chance." As adults, we turn our pleadings to God for another opportunity, just to start over again. 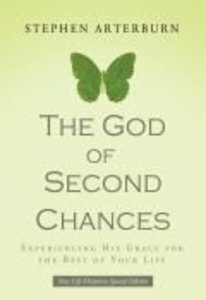 In this revised and updated version of The God of Second Chances, author Stephen Arterburn takes us through his own journey of pleasure-seeking and ambition to a life-changing encounter with the reality of God's grace. Arterburn is painfully honest, sharing his personal experiences with sexual immorality that culminated in the abortion of his child. It was then, desperate and at the end of himself, that Arterburn cried out to God for a second chance. Through his willingness to share his struggles, Arterburn helps us to confront our failures and reach out for God's restorative touch. With a gentle humor, he encourages us to look beyond ourselves and discover the joy in serving others and investing in the things that really matter. In doing so, we will learn what it is to be restored to God through unconditional surrender and receive healing from the scars left by our own mistakes. About "The God of Second Chances"